Above - A Google StreetView Image of the former Circus of Varieities, Bristol - Click to Interact. The Circus of Varieties was situated on Park Row in Bristol and, as far as I have been able to ascertain, the building was put to a number of uses over the years including a Roller Skating Rink, an exhibition hall, and a Cinema called the Coliseum Picture Theatre, which opened in 1912 and closed in 1924. During WW1 the building was even in use as an aircraft factory. The building was situated opposite the former Prince's Theatre which was destroyed during WW2 on the 24th of November 1940. 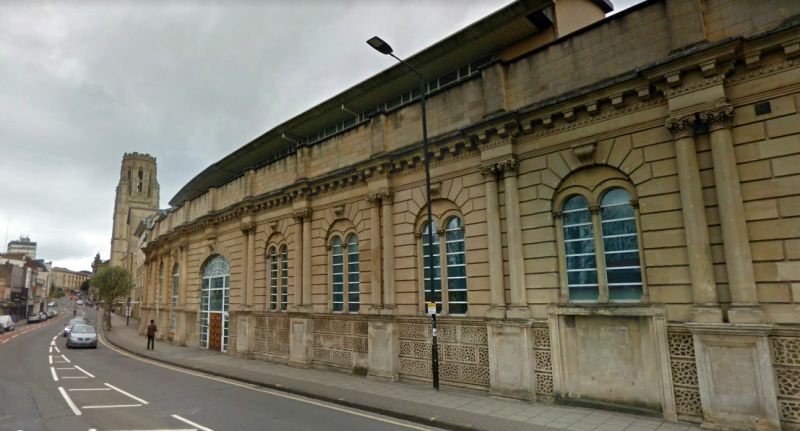 The Coliseum building was itself mostly destroyed at the same time but its facade remains to this day, behind which is now the Bristol University School of Engineering. Arthur Lloyd and his wife Katty King are known to have performed at the Circus of Varieties on the 30th of May 1887, see poster right, and review below. Right - A Poster for Arthur Lloyd and Katty King at the Circus of Varieties, Bristol on the 30th of May 1887 - Click to Enlarge. The above review and small advertisement were first published in the Bristol Mercury, 31st May 1887 and was kindly sent in by Denis Downes whose wife's Great Grandmother was Vinney Bishop who appeared in the entertainment that evening. Vinnie Bishop was also the mother of early 1900s boxer Willie Farrell.